Venezuelan president Nicolas Maduro dodged an apparent assassination attempt when drones armed with explosives detonated while he was delivering a speech, officials said. Mr Maduro and his wife, Cilia Flores, looked up at the sky and winced on Saturday after hearing the sound of an explosion pierce the air. He was giving a speech to hundreds of soldiers in Caracas which was being broadcast live on television when the incident occurred. Information Minister Jorge Rodriguez said the incident took place shortly after 5.30pm as Mr Maduro was celebrating the National Guard’s 81st anniversary. The visibly shaken head of state said he saw a “flying device” that exploded before his eyes, and thought it might be a pyrotechnics display in honour of the event. Within seconds, Mr Maduro said he heard a second explosion and pandemonium ensued. Bodyguards escorted the Venezuelan leader out of the event and television footage showed uniformed soldiers standing in formation quickly scattering from the scene. He said the “far right” working in coordination with detractors in Bogota and Miami, including Colombian president Juan Manuel Santos, were responsible. Venezuela’s government routinely accuses opposition activists of plotting to attack and overthrow Mr Maduro, a deeply unpopular leader who was recently elected to a new term in office in a vote decried by dozens of nations. He has steadily moved to concentrate power as the nation reels from a crippling economic crisis. In the midst of near-daily protests last year, a rogue police officer flew a stolen helicopter over the capital and launched grenades at several government buildings. Oscar Perez was later killed in a deadly gun battle after over six months on the run. 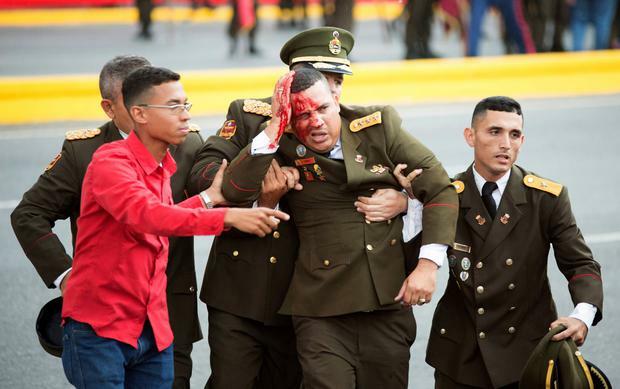 Attorney General Tarek William Saab said the attempted assassination targeted not only Mr Maduro, but rather the military’s entire high command on stage with the president. Prosecutors have already launched their investigation and obtained critical details from the suspects in custody, said Mr Saab, adding that he would give more details on Monday. “We are in the midst of a wave of civil war in Venezuela,” he said. Firefighters at the scene of the blast disputed the government’s version of events. Three local authorities said there had been a gas tank explosion inside an apartment near Mr Maduro’s speech where smoke could be seen streaming out of a window. They provided no further details on how they had reached that conclusion. A Colombian official with the president’s office described Mr Maduro’s claims that Santos was involved in the attack as baseless. Adding to the confusion, a little known group calling itself Soldiers in T-shirts claimed responsibility, saying it planned to fly two drones loaded with explosives at the president, but government soldiers shot them down before reaching its target. David Smilde, a senior fellow at the Washington Office on Latin America who has spent decades researching Venezuela, said the incident did not appear to be a staged attack by Mr Maduro’s government for political gain. The “amateurish” attack prompted embarrassing images of Maduro cut off mid-sentence with droves of soldiers running away in fear, making the president appear vulnerable, Mr Smilde said.